When setting up an aquatic turtle tank, you can create something natural and aesthetic that will suit your turtle’s needs and become a beautiful piece of décor in your home. Different types of turtles have different housing requirements -- the water temperature, lighting, basking site and size of land area will vary per species, but a few basic tips for a natural turtle tank will work for almost any aquatic turtle. 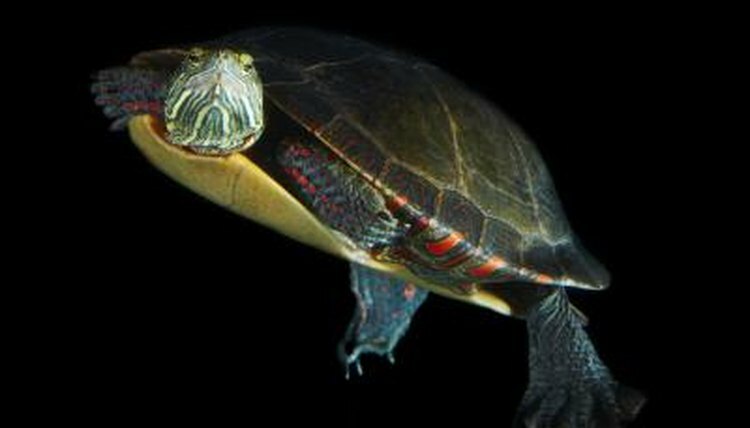 When setting up a natural enclosure for an aquatic turtle, consider that you'll be adding aquatic plants and using at least 25 percent of the tank for land. Add about 15 to 20 gallons to your species' minimum tank size; for example, if your turtle needs a 40-gallon aquarium, purchase a 55- to 60-gallon tank for a natural setup. When you're setting up the larger enclosure, make sure to purchase a filtration system that will accommodate the larger tank. Some turtle species require UV lighting. A UV tube or UV bulb will be sufficient if it's placed above the water area of the enclosure; UV will be beneficial for the aquatic plants. Set up a basking area above the land area using a heat bulb. If the water needs to be heated, use a submersible water heater to ensure that the water stays around 78 degrees Fahrenheit. To create a land space in the aquarium, you'll create a sloping base with a piece of plexiglass. The slight angle will form a basin on the low side and a beachhead in on the other, and will make it easier for the turtle to get in and out of the water. You can manipulate the areas of water and land according to the angle of the plexiglass -- experiment with cardboard to get exact measurements for your plexiglass base. Ensure that the high side of the sloping base falls at least 6 inches shy of the top of the tank to prevent your turtle from escaping. You want there to be sufficient swimming room, which will differ from specimen to specimen. Using aquarium silicone, secure the plexiglass in the aquarium and let it cure for at least 48 hours. Fill the bottom of the land area with large rocks to take up the space, except for the top. There, use smooth rocks, cypress mulch, coconut coir or moss for the actual basking area. Choose a substrate that is easy to clean and safe for your turtle. You can use sand or gravel, but sand is hard to keep clean and gravel may be eaten. Smooth, pebble-size stones and fluorite -- a porous clay gravel -- are popular choices for turtle substrate because they're safe for turtles and allow root growth for aquatic plants. If you decide to try fluorite, let the water settle for a few days, allowing the filter to remove the dust and debris; under-gravel filters work best if you decide to use fluorite gravel. Add driftwood, large stones and aquatic plants to the setup to make it more natural. Adding live plants to your natural enclosure will help keep algae and bacteria at bay because the plants produce oxygen and filter nitrites and ammonia. Many turtle species will also enjoy eating the plants, which is why it is important to choose plants that are not toxic to turtles. Common waterweed (Egeria densa), Amazon sword plant (Echinodorus amazonicus), java fern (Microsorum pteropus), hornwort (Ceratophyllum demersum), duckweed (Lemna minor) and Anubias species.